I have putzed on and off with 12 strings for decades. Generally I remove the three lowest octaive strings so I can get a thumping bass combined with the chorus like highs. I have not had one in years though. A little while back I was out goofing around and ran across a 12 string (I don't think I have ever bought a guitar intentionally - I just seem to stumble across them). It was cheap so I figured what the heck and I am now the proud owner of a 1972 Guild. I had forgotten how much fun these things are. I have been pretty much sticking to the standards - tunes like Gallis Pole and stuff I can play in Drop D tuning like Chump Man Blues , Statesboro Blues,and yeah, Big Road Blues. And OK I admit it - I did let loose on Turn, Turn, Turn a time or two. Anyway, if you ever feel like you are in a rut and a needing something different to kick start your juices - a 12 stringer may just be what the doctor ordered. And Blind Willie just don't sound quite right on anything else. Here be the obligatory quick pic. Beautiful! Guilds are great guitars! if I wasn't so broke that sucker would be on my wall right now! I never thought of removing some strings back when I had one--that's a good idea. . .
Those Guild 12 strings are very nice guitars. And 12 strings are a lot of fun to play. My old Gibson B-25 12 has been getting more attention than any of my other guitars lately just because of how different it makes me approach the instrument. Have fun with that one. I figure if a Guild 12 string was good enough for Wolf it is good enough for us. Lo-Fi wrote: Anyway, if you ever feel like you are in a rut and a needing something different to kick start your juices - a 12 stringer may just be what the doctor ordered. And Blind Willie just don't sound quite right on anything else. Nice guitar and I totally agree, there's something special about 12-stringers!! Just modified my Delta Rocket into a reso-12! Tried it at two gigs now and it works and sound very nice, will post a clip to demo the sound it produces.. Very cool. I've always wondered about a 12-string reso. I'd love to hear it when you get the chance. 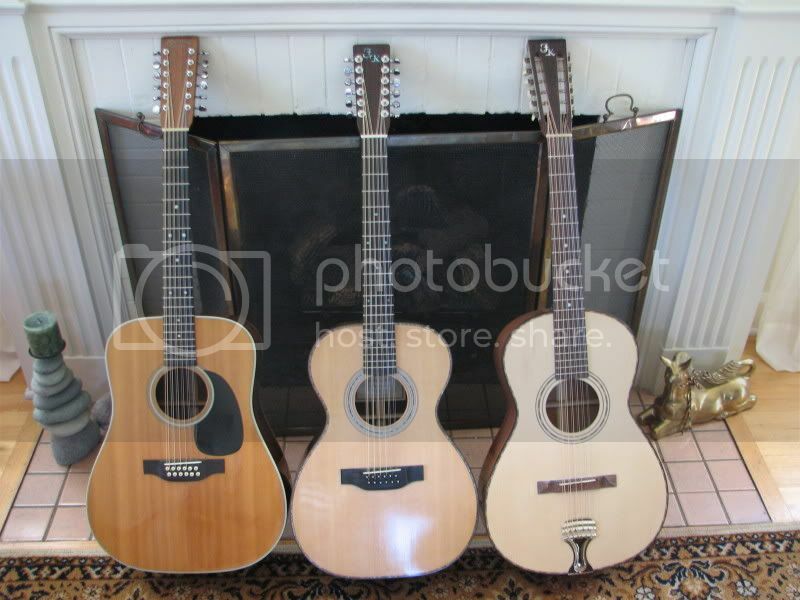 Why would you want only one 12 string? Freeman, do you play any of those in altered tunings? For that matter, does anyone else play their flattop 12 in altered tuning? I've just retuned my solid top Yammy to open E (I've got very light strings on her and I did some calcs which revealed that using just six strings tuned standard E using 13s,the neck would be under less stress with12 strings tuned open E with these extra lights ) and the sound is very orchestral. I'm not sure I like it though, it's all a bit messy. But I'll leave her like that for a while to get used to it. It makes precise fingerpicking a bit of a mission. So is there anyone else out there with an open tuned flattop 12? Peace. Well, I made a move into 12-string ownership (largely due to this thread).. Just a '70's Epiphone. Not bad to get used to the extra strings, but not a huge investment, either. It certainly does get me rethinking things a little. It's nice when you find an affordable guitar that sounds good enough and plays well enough to inspire you try try some new stuff and not break the bank. Fancy guitars are great...I just don't have the bankroll. ricbleu wrote: Freeman, do you play any of those in altered tunings? For that matter, does anyone else play their flattop 12 in altered tuning? I've just retuned my solid top Yammy to open E (I've got very light strings on her and I did some calcs which revealed that using just six strings tuned standard E using 13s,the neck would be under less stress with12 strings tuned open E with these extra lights ) and the sound is very orchestral. I'm not sure I like it though, it's all a bit messy. But I'll leave her like that for a while to get used to it. It makes precise fingerpicking a bit of a mission. So is there anyone else out there with an open tuned flattop 12? Peace. My 12 strings are never in "standard" tuning, they are always down at least two semi tones, then often in something open from there. The one one the right is long scale, it is designed for C or C#, but right now is in whatever the equivalent of open G down four semi tones. I play all my flat tops in open and altered tunings also, plus I own three resonators and a weissenborn which are never in standard. I have an old Yamie sixer that stays in open C (special string set). Heck, even my Lester gets open tuned for a little slide. So what you are saying is that you've strung your Yamaha 12 as a sixer and tuned up to E? That will probably work, but you've got all the problems of a 12 with the wide nut, weird spacing, yadda yadda. Put a set of mediums (12'') on it, tune down two semi tones to D standard, then try the equivalent of open E (or C or D). I promise you that puppy will roar! Thanks a heap, Freeman. I'll get right onto that in the morning. I admit that standard tuning on the 12 doesn't appeal, and that's why I've been thinking of selling her. But I'll do as you advise and see what happens. It always kick starts the creative motor to get a new angle on something. Peace.